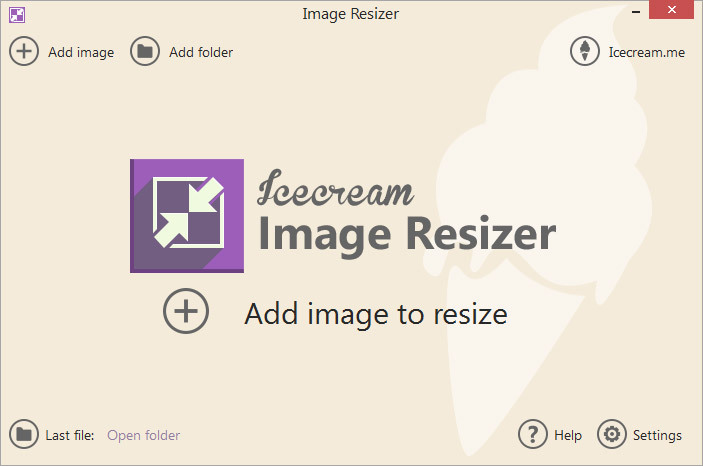 Icecream Image Resizer 2.07 Free Download - Easy-to-use image resizer with advanced options and bulk mode support. Easy-to-use image resizer with advanced options and bulk mode support. Icecream Image Resizer is a tool for changing the parameters of your photos by using custom or preset profiles. The program also features additional options to give you more control over the output files. Batch resizing support gives you an opportunity to change several photos at a time instead of repeating the process for each single file. You can also add the entire folder to resize all the photos stored in it. The program sets no limitations for maximum files quantity and you can add and resize as many images as you want within the same session. Users can opt for preset profiles for different tasks (email, desktop, HD 1080p, HD 720p, and 320x200, iPhone 5, 6 and 6 Plus) or set the parameters manually. Icecream Image Resizer also allows keeping original aspect ratio to avoid breaking the original ratio and end up having a stretched image. Besides, you can enable the vertical image recognition option to work with vertical photos. Drag and drop support helps you add files directly from where they are stored without searching for them with Windows Explorer. Icecream Image Resizer is a smart tool that managed to combine extended capabilities, stable performance and simplicity within the same interface. The good news you do not have to pay for this application, use additional installation software or request activation keys. Statement: First, please download the orginal installation package by clicking the download link. Of course you may also download it from the publisher's website. Using Icecream Image Resizer crack, key, patch, serial number, registration code, keygen is illegal. The download file hosted at publisher website. We do not provide any download link points to Rapidshare, Hotfile, Depositfiles, Mediafire, Filefactory, etc. or obtained from file sharing programs such as Limewire, Kazaa, Imesh, Ares, BearShare, BitTorrent, WinMX etc. Software piracy is theft. If you like Icecream Image Resizer please buy it.